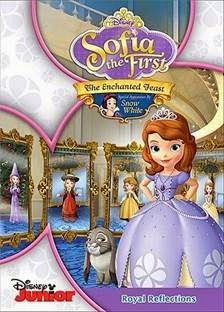 Sofia the First hits shelves on August 5th with a new DVD, called Sophia The First: The Enchanted Feast. Join Sofia as she journeys throughout the kingdom, making new friends and learning valuable lessons. Special appearance by Snow White! All the monarchs from Enchancia’s neighboring kingdoms have come to watch a dazzling display of magic: First, Cedric will conjure up a fabulous feast. Next, he’ll transform the banquet room into a hall of amazing “morpho-mirrors.” But before the fun begins, wicked Miss Nettle (disguised as “Sascha The Sorceress”) crashes the party with a scheme to steal Sofia’s magical amulet. Can Sofia foil the bad fairy’s plan before it’s too late? Perhaps…with help from Snow White, who reminds her it’s important to trust your instincts. The Enchanted Feast- a dinner gone wrong after a un-welcomed guest tries to take over the castle, Sofia must come to her families rescue by trusting her intuition. The Buttercups- Sofia goes on quest to earn her sunflower patch, and learns to speak up. Great Aunt-Venture- Aunt Tilly has adventure in her bag and teaches Sofia to look beyond what she sees. Two Princesses and a Baby- Amber and James are celebrating their birthday, and Amber makes a request which has her watching a baby James. My girls LOVE Sophia the First and are super excited about this DVD. Enter to WIN a copy of your own below! My niece has watched Sofia. She has Sofia clothes and just loves wearing them. I have watched it with my child and I think it's cute and kiss love it. My daughter is a Sofia fanatic! She absolutely loves her.I like to watch with her too!